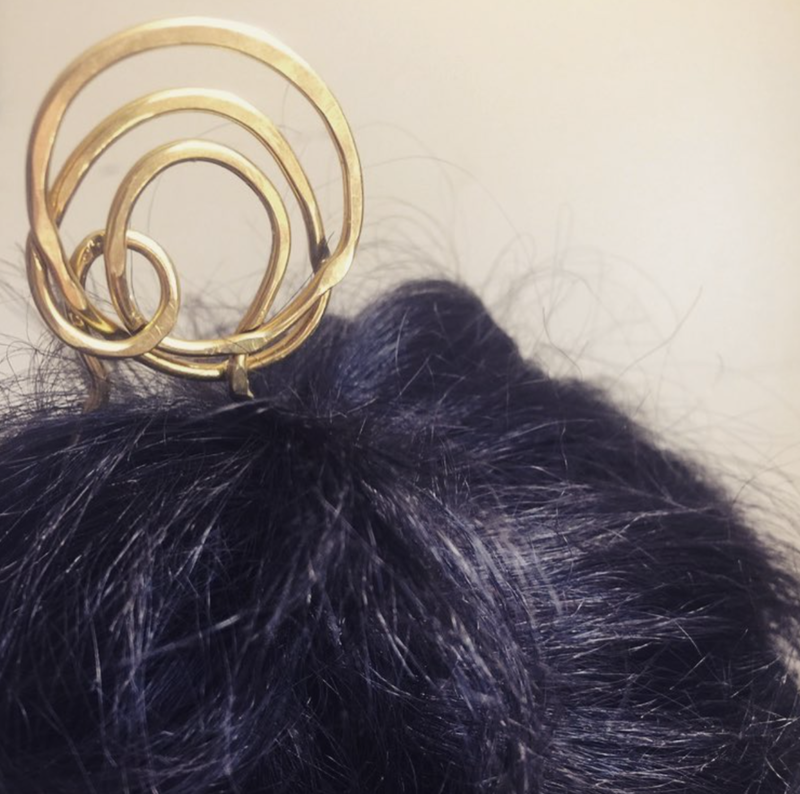 I came across Sade's work over a year ago and was enthralled by the whimsical forms, her restraint as an artist, her evocative, rich, yet minimal moods, and the effectiveness of her consistent narrative through metalworker jewelry. To this day Sade's wearable forms strike nostalgia in me. I love her joyful spirit and old soul and how she has tapered both into reminiscent pieces for women who speak even when they are silent. Her brilliance is understated but that's OK as it leaves a bounty for the world to discover over the course of history. This is why she's a Narratorial Creator. 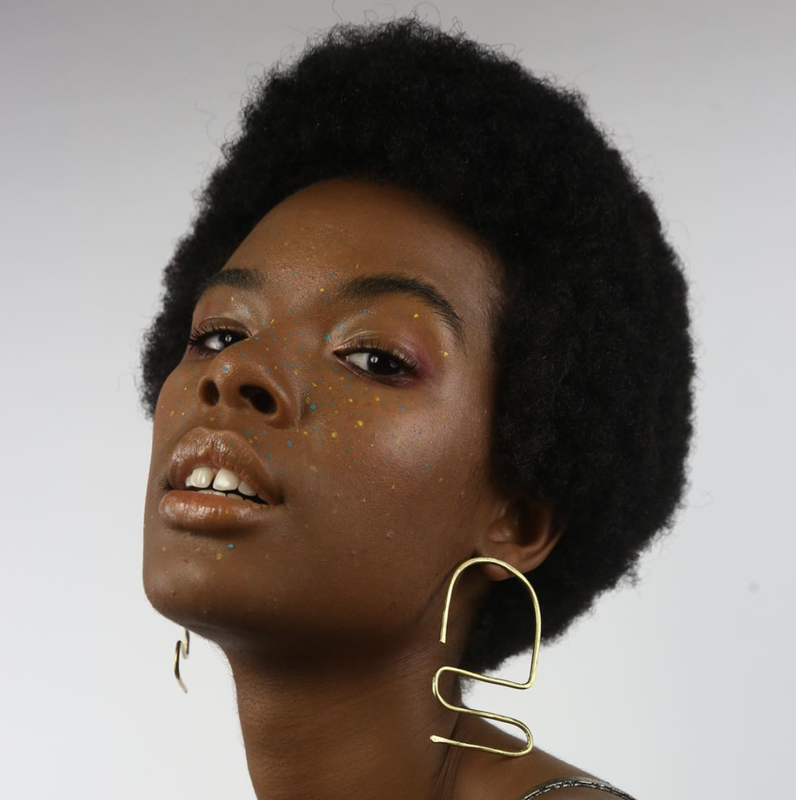 Sade Mims is a visual artist working in several different mediums to create and produce thought provoking work, timeless essentials for the modern women and curated spaces that preserve the culture she most connects with. Born in Philadelphia by way of New Jersey, Sade has been influenced by both the metropolitan setting from the city of brotherly love, as well as the nature backdrop of her South Jersey upbringing. She emerges the two, to create art that is reflective to these counteractive truths. Today, Sade is now rooted in Bedstuy, Brooklyn, a place she considers an inveterate space for her. In the past, her work has been recognized by Essence, Nylon.com, LA Times and Racked.com. Community stands at the forefront of Sade's art and productions, she's deeply devoted to creating new spaces to bring people together, and to surround them with love. I tend to believe that when we start a business or art project it’s because we believe something about that thing we have decided to do. What do you believe about jewelry? What do you think it should do for someone? Hmm I actually never thought about that. So thanks for taking me there. I believe my jewelry is meant to spark dialogue, really. It’s so simple and vague, but I honestly think that’s the purpose. 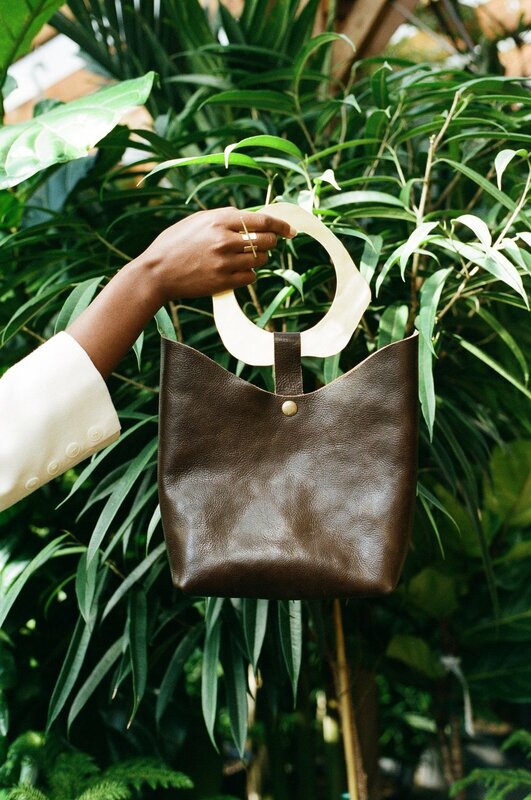 Fashion is fun and also pretentious and environmentally damaging, so I started out using old household materials to make pieces, so my initial role out of pieces was a response of the waist that comes from the industry. I was focused on sustainability and refurbished goods, starting in 2010. But now, I’m interested in designing pieces that spark conversation, and that make you want to create. Most of my designs are bolder/statement pieces, and so when I’m designing, I often think back to all the women who wear bold jewelry. Like what those women do, how they’ve impacted my life and my creative process at one point or another. It’s seems like a small thing, but those women were almost always brave, business owners, strong, sassy and educated, and the conversations that started out as a compliment to their eclectic jewelry always ended leaving me inspired, more informed and sometimes the start of a long lasting relationships. I want everyone that wears my pieces, to experience that with someone. It’s sooo damn beautiful. Talk about restraint. How do you define that “pulling back” and allowing a creation to breathe? I’m always trying to practice restraint, and implement it in my creative process. When it comes to designing jewelry, I’ve pretty much mastered the ability to pull back. This shows through my hesitation to release a new collection too frequently, or on a season by season basis. I’m just honestly taking my good ole time. This has been a growing process and practice though, for sure. I feel as if I’m just now at a place that I’m comfortable about pulling back and knowing exactly when to do so. It’s refreshing, because the personal pressure is off. to be whimsical, other-worldly. Why do you think this is? How are you contributing to this beautiful counternarrative? so the world has a hard time handling this natural attribute that we are born with. It’s like, our superpower and the world is intimidated by it, rightfully so. I’m also black and that is double the fun and flavor. My response to this is simply, to just be. especially when I’m in a space filled with people who don’t look like me. most liberating two words I've heard in a long time. by the pressures of this current culture? Yeah, your mom has got it right! being true to yourself and creating art that is centered around your reality. "Just be" also means to be accepting of yourself and your process. and the timing destined for you, and you only. the first step to freeing yourself, as an artist and as a teastained woman. Are you an old soul? Explain. Old soul? For sure. Ever since I was a young one, my spirit has called for old music, and vintage clothing. This all plays a huge role in my creative process, too. I think I consciously and subconsciously look into old designs to create new work. 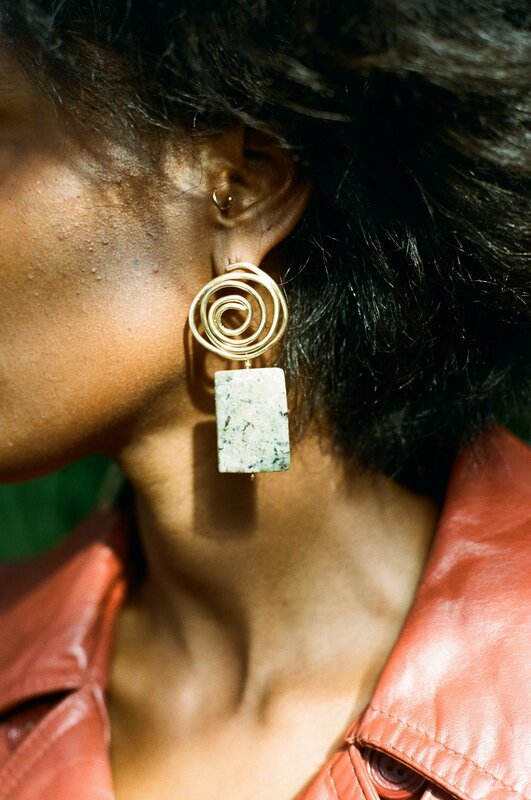 My most recent collection, "The Elements" literally reminds me of old 80s earrings, and that’s exactly what I was going for as I sketched out all that I was thinking. I wanted to recreate my grandmother’s jewelry, with an Edas touch. For me being an old soul was always isolator, possibly because my maturity was rooted in some form of childhood trauma, etc. I grew up in response to panic and stresses that I experienced and learn to respond to very young; reflexes most don't use until adulthood I was tapping into at 10 and 11. Where does your old soul stem from? Do you ever feel that your old soul isolates you in any way? What are some benefits of being an old soul and an artist? That is such an interesting and beautiful way to examine that, Chimene. For me, I think my old soul came from me mimicking the adults around me that I seemed to be fascinated by. It was very innocent and I found that I started to pick up several adult- like traits and stylistic choices, starting with fashion. I wanted to dress older, and not in a fresh, too mature way, but in a paisley dress that touches the ground kind of way. Like, I literally started to fall in love with vintage fashion at the age of 10, wearing clip-on earrings (even when I had my ears pierced) and ruffled skirts from the 70s. My mother was so influential and granting during this process, which was so amazing and shaping to the woman I am today. My old soul isolates me in a way, for sure. My friends have a running joke about me being absent from pop culture and its happenings, and I'm completely ok with that. Being an old soul has benefitted me in more ways than it has been a set back. I think it has also allowed me to make more sound decisions as an independent artist and to even have stronger business practices. I just learned you’re a twin and I think that’s so cool, not just because you and your sister have such a beautiful friendship but because you have such distinct identities. I have spoken to many twins who have expressed how finding themselves as individuals was a key challenge--pulling from the “we” to the “I” so to speak and not using the other as a “crutch” for living, etc. Was being your own person/pursuing your own dreams ever an issue for you as a twin? Being a twin is such a blessing. 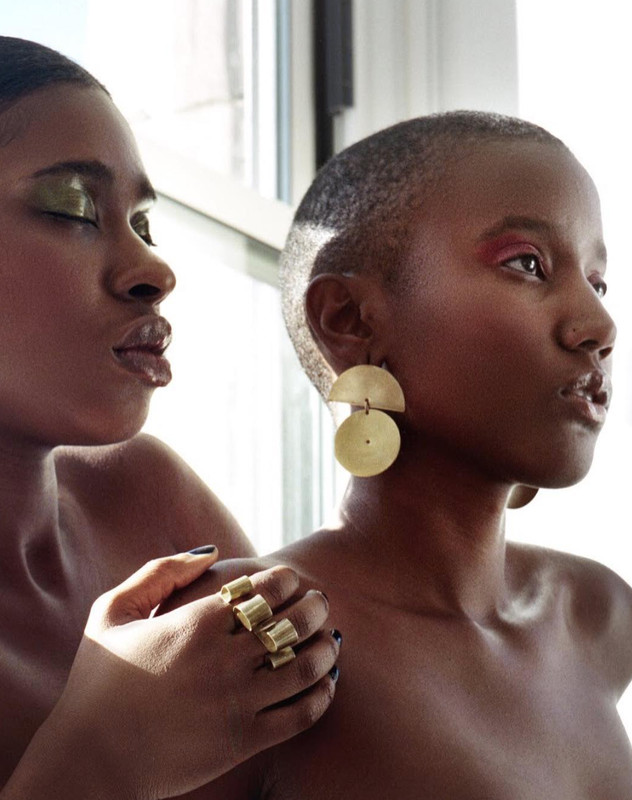 I recently got interviewed by Black Girl Magik, and they asked about growing up a twin and has that allowed us to see the best in ourselves. I think that having her by my side for the last 25 years has done just that. It’s literally allowed me to be introspective in the most beautiful and healthy way. I remember going to dance school because she decided to, and after my second year in, I dropped out and had my parents sign me up for private art lessons. That was the beginning of me doing the work to find my own identity. I was 12(?) at the time, and nervous as hell because I was allowing myself to do something that I only would be able to experience, but that was the birth of some pivotal and life changing patterns. It's truly amazing how we can reshape our paths as individuals, through recreating patterns. Placing ourselves in new situations just for the sake of transformation and exploration is interesting to say the least. I'm always curious as to how people think of such seasons. What's your take on voluntarily reshaping bones so as to rediscover ourselves? You have to be open to voluntarily place yourself in spaces that harvest change. You have to be willing and allowing of these experiences and present to take in the full shaping process. I think everyday we should be having moments like this, even if they are small moments and interactions, these moments are vital to artist and our creative process. Every experience is a moment that shapes us, so when we make conscious efforts to root ourselves in environments that make you question things, or that make you vulnerable, or even angry, we are starting the transformative process. My creative process typically starts with some music and a clear sheet in my sketch book. While creating I like to tap into softer, melodic tunes, that clear my mind and allow for some freeing up. This technique, heavenly influencing the work itself, is fluid, free forming and unplanned. I sketch, drawing lines, composing shapes and forging figures to the paper, and then I retract. I let those quick sketches marinate and I check back with them to see how they make me feel, hours, even days later. The concepts that stick with me, are the ones I end up creating metal prototypes with, and that is the birth of most of my work. It’s something about that unintentional format, that always seems to speak to me most. Have you ever fallen "out of love" with your work for a season where you fall off/just want a break from it? I have never fallen out of love with my work, but I do have moments of wanting to step away, and focus on other things, for sure. But Social media is a wonderful safety net for artist and business owners to often have those moments, but still appear relevant in the digital world. It’s literally about “posting content” and you can appear to be relatively active, even if you aren’t necessarily in “the zone”. And I’m not completely sure at this point if that is a healthy way of dealing with those moments, to be honest. But I’m still figuring this all out, every step of the way. Do you have a few songs you'd like to share with us to add to our playlists? Talk about thoughts. Creating original work requires focus that’s very difficult in the age of pinterest and instagram where you can search for someone in your industry and immediately feel small. How do you stay focused? What keeps you grounded? I deal with some major insecurities in a lot of areas in my life, and especially in my work. I’m often feeling vulnerable and sensitive about my work, and a strong sense of doubt in my creative process is something I constantly struggle with. I am now trying to just be patient with myself and that has allowed me to be more confident in almost every aspect of my life. I have a few practices that help me fight back, like drinking chamomile tea to calm me mentally and physically, or dancing, just pure dancing with my favorite people, or going home to be with my parents to decompress and be one with nature. I find that when I consciously make an effort to do these things, both my work and my energy around that work is backed by confidence. I wholeheartedly believe that! I've noticed how, by stepping back and practicing creative and personal sabbaths I am able to handle/hand over a lot of the things that weigh heavy in my mind. I have to remember that I am not the work I produce but also a HUMAN with a soul. What else would you suggest to an artist in the area of maintaining balance between self+work? I am still struggling with this, daily. Balancing self+ work is complicated and tricky. Some new techniques that I am trying to tap into and experiment with is creating work blindly and with no date attached to that work. I find that I often create work, and subconsciously I am thinking about the releasing of that project or piece. But when I dissociate my work from having a release date, which ultimately trickles down to a response from my audience/consumers, I take a load of pressure and expectancy off of myself, and that is liberating. So, make work, constantly, but go back to the days when you first discovered that passion, when you created because it was therapeutic and not monetarily rewarding. Revert back to the art school version of yourself, or the trial-and-error creative process. That's when you start to take the load of pressure off and balancing the two will be a lot clearer. So, so good. I believe many needed to read that! Your portrait (self portrait and photoshoot) game is strong and yet it does not come across as narcissistic but like a sister’s personal section in the family album. Can you discuss creating yourself by being in charge of your image? How do you believe you produce/co-create images of yourself that are ubiquitously referential and true to your creative narrative though you remain the main subject? Yes, I love that, that’s actually is something that is always on my mind, like “how do these selfies read? Am I exposing too much.. etc”. But I want to be the sister in your family album or the cousin you confide in, and even the Aunty with the funky shoes. Being in charge of my image is so important to me but I also try not to take myself too serious. It’s funny, for the longest time I didn’t use the IG story feature because I didn’t know if I was completely comfortable with showing anything other than still imagery. I’m very ambiguous in the most unique and interesting ways, like for example, I’ve never had a profile picture with my face in it, only artwork I've created can live there, and that’s the way I prefer it. It also is synonymous to the way I post on my business page. You mentioned this in another question, and it’s very true. I like for my audience to have to paint the picture themselves and interpret content without me swaying their thoughts on things. I used to keep a journal, that I would frequently write in, but New York City has changed me a bit (in so many ways, some for the better and some for the worse). My entire duration of college I practiced meditation to help strengthen my brain and memory muscles. I had been so forgetful during that time, and I couldn’t understand what was causing it. (I now know why). But I remember thinking, “I’ll get rid of this journal and I’ll start to mentally jot down things, as this will help me improve my memory” - that was so stupid. So since then, I only keep notebooks that house my sketches and work notes. I do however yearn to get back into journaling, because I think it will be a wonderful addition to my practice of patience and restraint. I also love the idea of being able to go back and read what you said on ‘this’ day, and who you were ‘then’, or what emotions you went through during ‘that’ time. I love those moments, when you are able to have a tangible documentation of your evolution. You can shop Sade's work here!